The highly successful EL series of low-cost and compact linear bench power supplies has been extended. The new models offer both higher power and higher current. 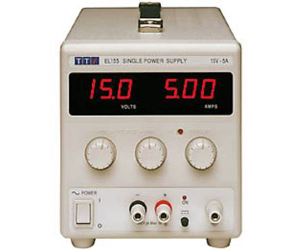 The EL155 provides 0 to 15V at 0 to 5A (75 watts maximum) while the EL303 provides 0 to 30V at 0 to 3A (90 watts maximum). Both models retain the features that characterise the EL series, namely silent convection cooling, linear regulation for low output noise and excellent transient performance, compact dimensions, and the convenience of a dc output switch.